WELLINGTON, Kan. (AP) — A small-town Kansas woman is gaining national attention for her rainbow hair art. Ursula Goff has more than 102,000 followers on Instagram who get to see photos of hairstyles she made that include dyed polka dots, mosaic designs and painted eyes. She was recently featured on the Rachael Ray Show with a segment about her hairstyles. 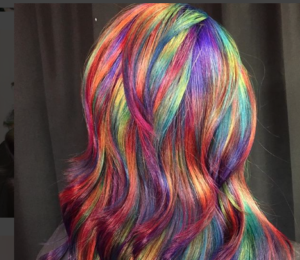 “The rainbow hair trend has been flooding our social media feeds for quite some time now — but one extremely popular hairstylist from Kansas named Ursula Goff … has truly taken the phenomenon to another level,” Cristina Corvina wrote for the show. Goff has been styling hair for more than a dozen years, but didn’t start gaining social media attention until about three years ago. She the reactions to her art weren’t always positive in rural Kansas. She finds her inspiration from “almost everything,” and embraces what some consider weird or crazy. Despite the national attention, Goff said she has no plans to leave the small town of Wellington anytime soon.